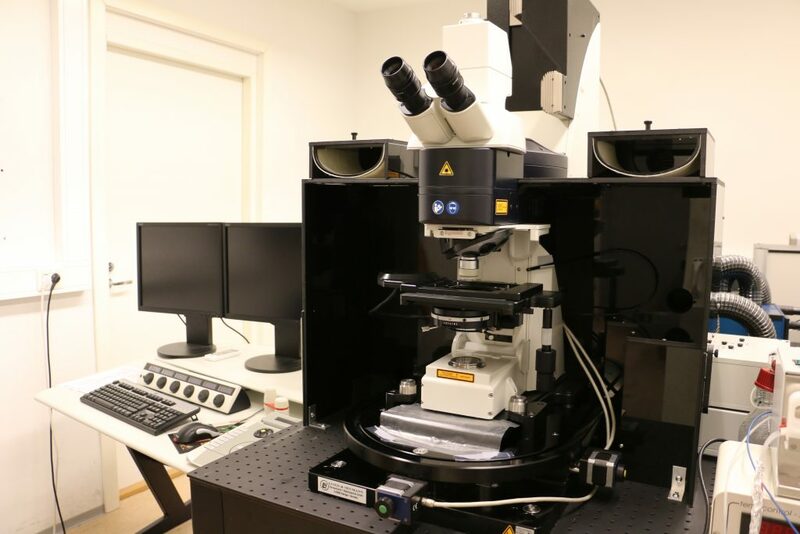 The Nikon Eclipse Ti-E offers improved system speed, increased flexibility and efficient multi-mode microscopy as part of a fully-integrated microscope system that is ideal for high-end research and live cell imaging. In addition to glass bottom dishes, plastic dishes can be used. The system is especially suited to high-content applications that involve multi-well plates. A motorised system for wide-field non-fluorescence and fluorescence imaging. 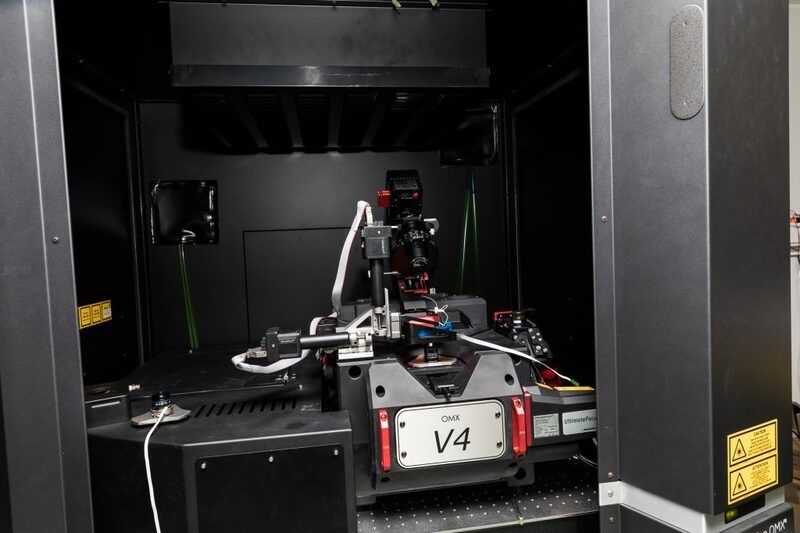 Motorised specimen stage enables high resolution mosaic imaging, which can be used, for example, to generate high resolution molecular maps of tumor tissue slices. Imaging is possible from well-plates, tissue slides and glass-bottom dishes. The instrument can perform three colour fluorescence imaging with a motorized turret. There is also optical sectioning possibility (3D) with the ApoTome.2. It has two light sources for brightfield imaging (light below the sample or light above the sample). Camera: Hamamatsu ORCA Flash 4. 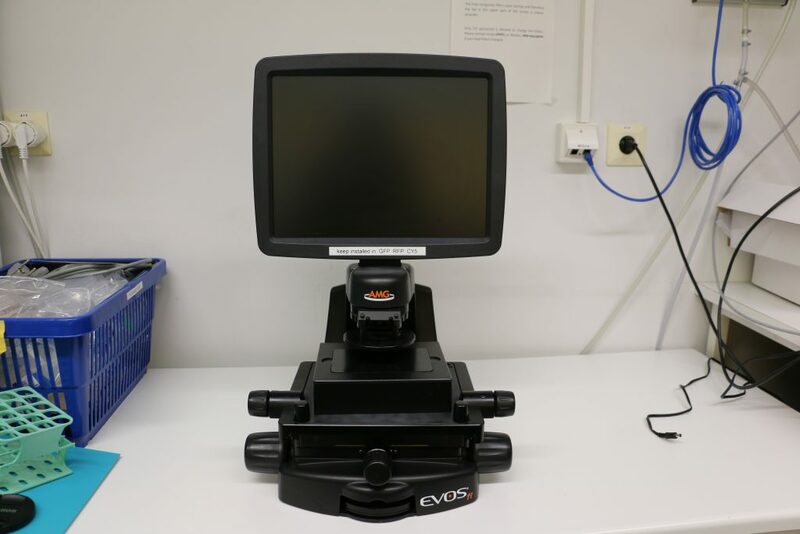 EVOSfl is a convenient inverted microscope for cell cultures and quick sample checking. The microscope has a transmitted and fluorescence light options. The illumination system is based on LED cubes, which makes working flexible. 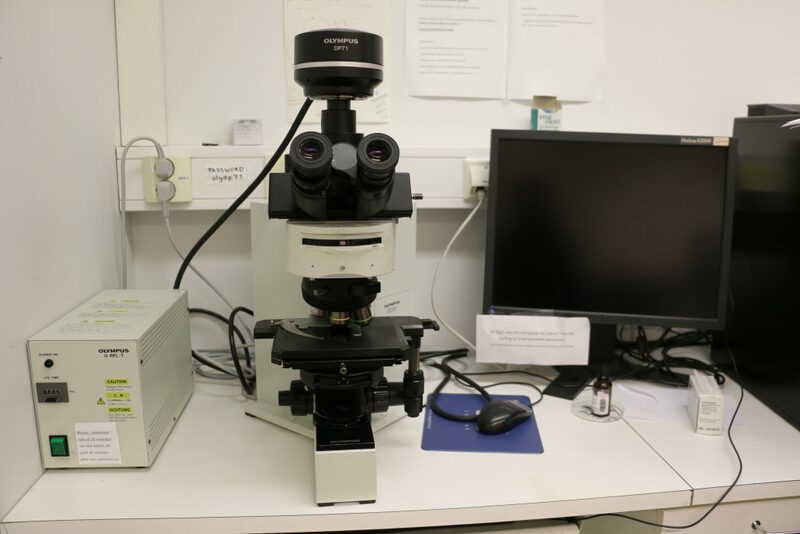 The camera and the computer are integrated in to the microscope stand. Images are saved on external USB memory device. 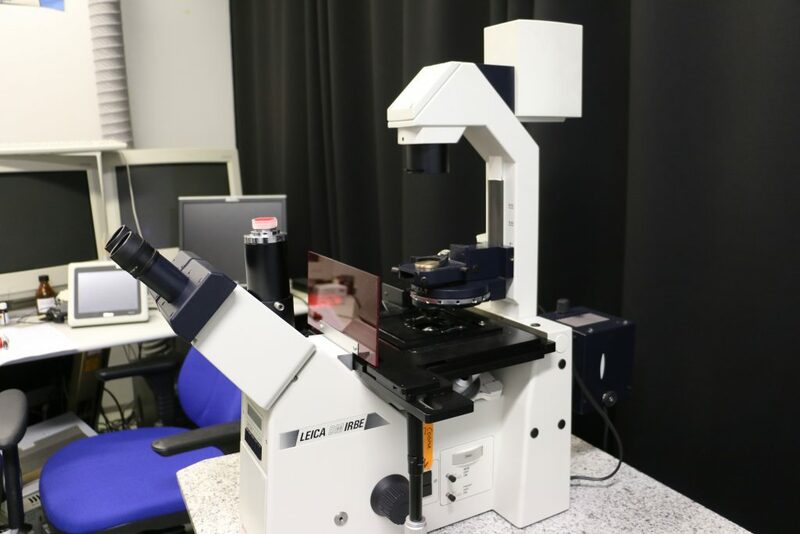 The manual Leica DMRE upright microscope is a practical tool for basic fluorescence imaging of microscopy slides. The objectives are high quality and sensitive. Leica DMRE is equipped with a high resolution camera. 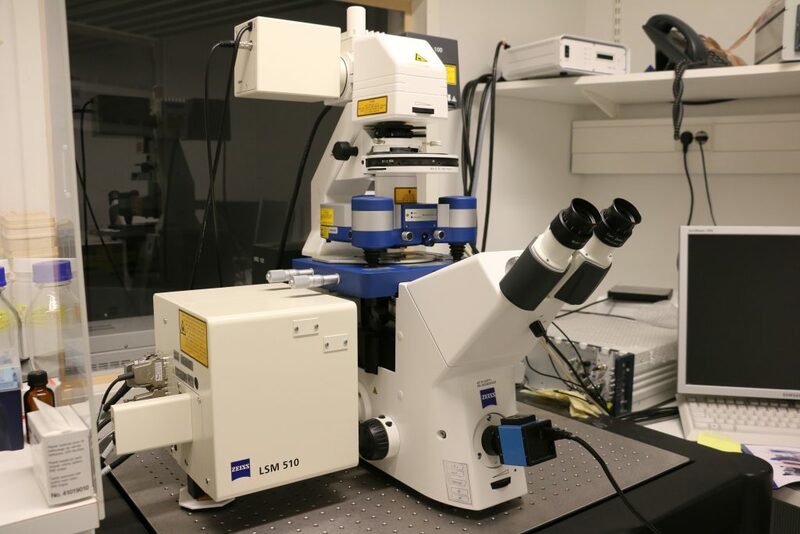 This Leica research microscope is optically very good for wide field microscopy of fixed samples. It can be used in normal fluorescence or transmitted mode, or in darkfield mode. 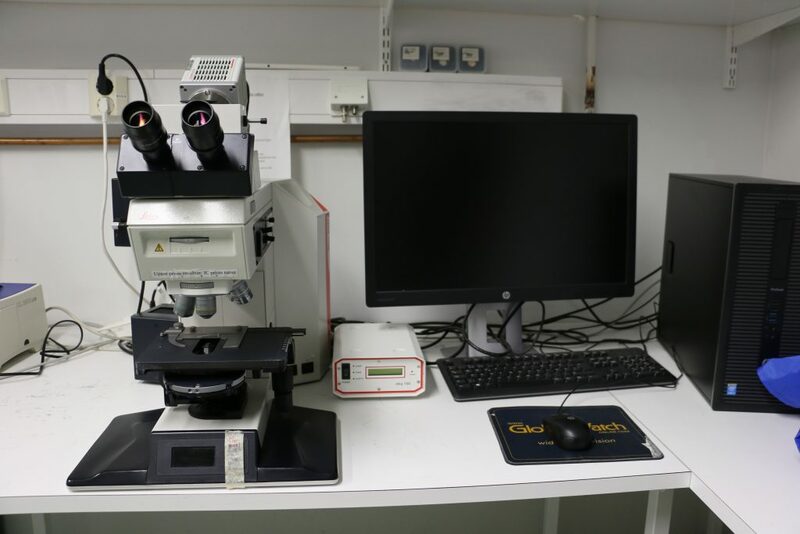 The microscope is equipped with a new easy-to-use Nikon color camera, with a DS L-3 standalone control unit (touch screen). Images are saved on an external USB memory device or a CF card. Fluorescence, transmitted light and darkfield are possible with all magnifications. Moreover, phase contrast is possible with all objectives apart from 10x. The easy-to-use color camera is operated with a DS L-3 standalone control unit without computer (touch screen). The largest image size with a 10x objective is 0.86×0.64mm. Images are saved on an external USB memory device or a CF card (type I). Olympus BX60 upright fluorescence microscope is a good tool for brightfield and fluorescence imaging. It is equipped with a cooled DP71 digital camera which is suitable for both fluorescence and colour imaging (Bayer colour filter). The microscope has 4x, 10x, 20x, 40x and 100x objectives. Fluorescence filters include DAPI, FITC and rhodamine. This super-resolution Abberior STED/RESOLFT is a sophisticated, highly flexible open platform that can be modified, extended and upgraded at any given time. 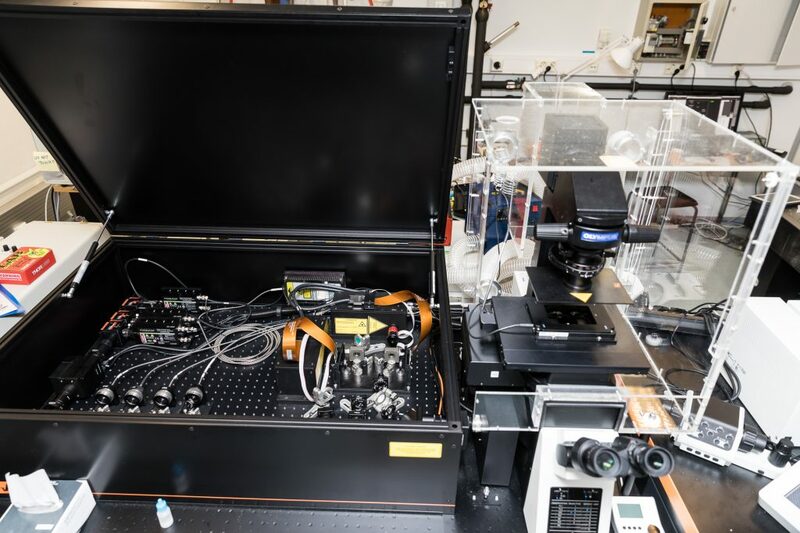 In its current configuration the system is equipped with two pulsed excitation lasers (488, 640nm) and two pulsed STED lasers for depletion (580, 775nm) allowing super-resolution in two different colors. A third color option is soon to be included with a 532 nm that is currently in place. At this moment its typical resolution in X and Y axis is ~25-30nm with super-resolution for the Z axis to be introduced in the very near future thanks to the Abberior Instruments Easy3D STED module that we are acquiring. This module uses a programmable spatial light modulator (SLM) to create phase patterns required for 2D and 3D STED microscopy and at the same time, it can also be used to correct for optical aberrations. Easy3D with adaptive optics will also enable deep imaging with penetration up to 80 µm into cleared tissue using an oil objective. Without adaptive optics, the mismatch between immersion oil and sample will lead to complete signal loss. Another key module currently available in our STED system is the imaging mode called RESCue (Reduction of state Transition Cycles) STED that reduces the light dose sent onto the samples without compromising resolution. Thanks to RESCue STED and upcoming software to control the existing live cell chamber, the Abberior STED at BioPhysics will be capable of doing live-cell super-resolution STED imaging. 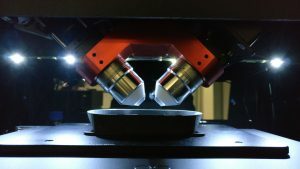 The Zeiss LSM 880 Airyscan with the Fast Mode is a state-of-the-art inverted microscope designed for imaging in both laser scanning confocal and the novel super-resolution technique Airyscan. 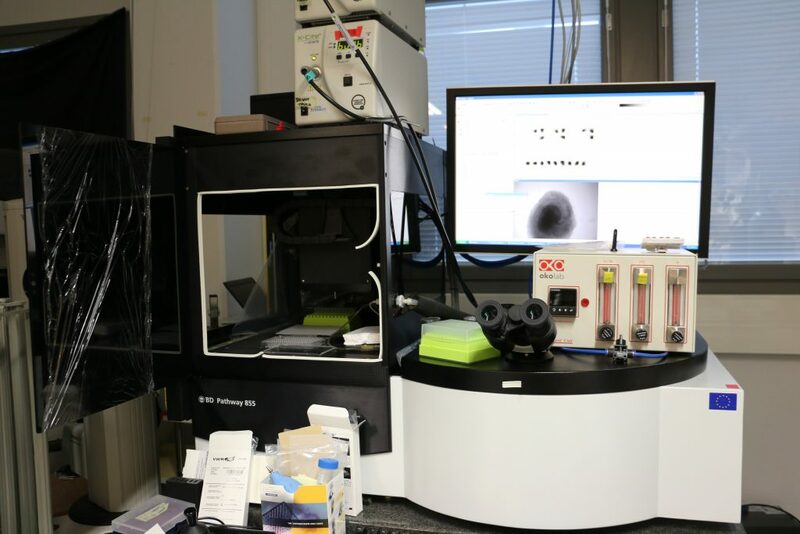 The system is dedicated for fast and sensitive live cell imaging with a full incubation chamber. 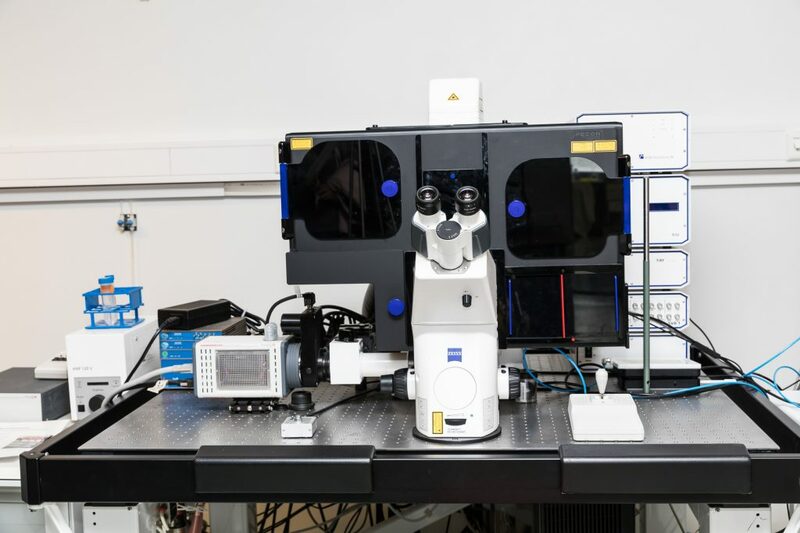 The Zeiss LSM780 laser scanning confocal microscope is a versatile system for all cell and tissue imaging experiments. The instrument has a CO2/humidity/temperature controlled incubator for live cell imaging. Available modules include FRAP, FRET, Multiple time-series and FCS. There is an extra sensitive spectral GaAsP detector for FCS and FCCS and a cooled PMT for more sensitive detection on red range. Also, anisotrophy measurements are possible. 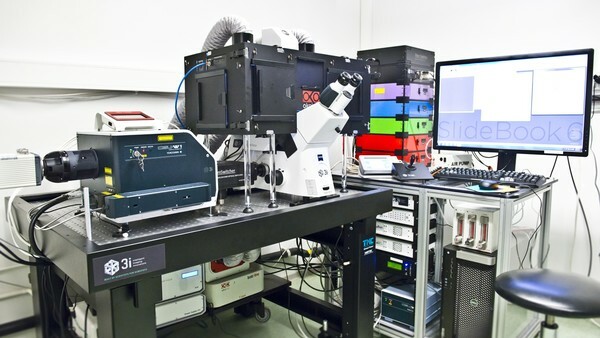 The 3i (Intelligent Imaging Innovations) Marianas spinning disk confocal microscope is perfect for fast gently imaging of live samples or large fields of view. Fast z-stack acquisition together with tile options facilitates collection of large 3D data sets. 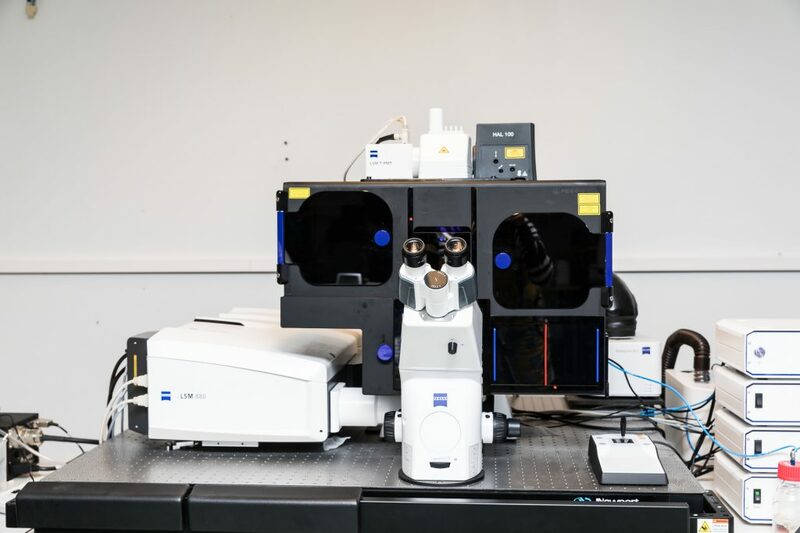 The Zeiss LSM510 JPK AFM is a basic laser scanning confocal microscope set up with an unique features to integrate atomic force microscope (JPK Nanowizard I) to the imaging system. This allows simultaneous imaging with the optical microscope. Scan range is 100 x 100 x 15 μm. BioCell for biological samples under physiological conditions. 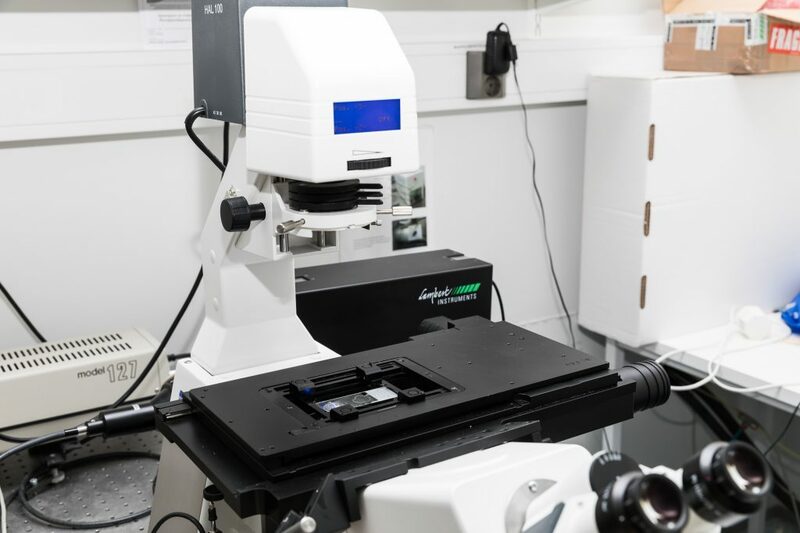 All standard imaging modes, and a CellHesion module that extends the Z range to 100 μm and enables cell adhesion measurements with a cell attached to the cantilever. 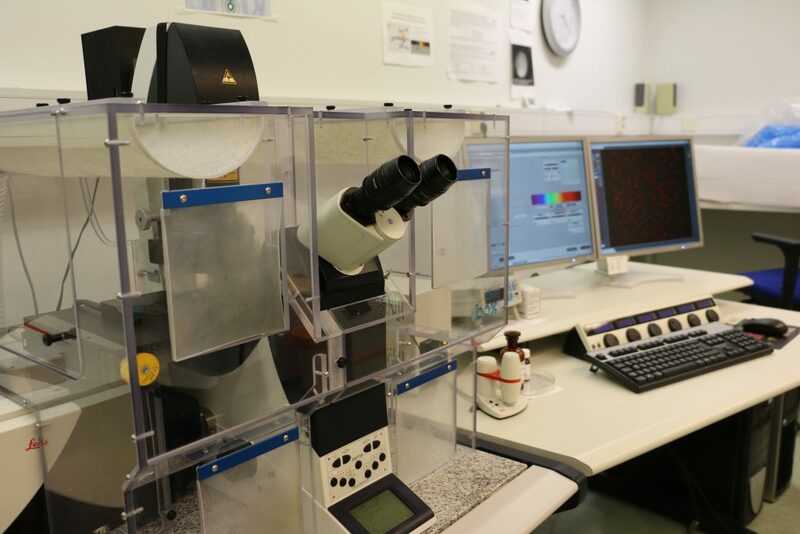 The microscope is equipped with an incubation chamber for live cell experiments. The Leica TCS SP5 is a standard confocal microscope, suitable for scanning of fixed samples and live cell imaging. 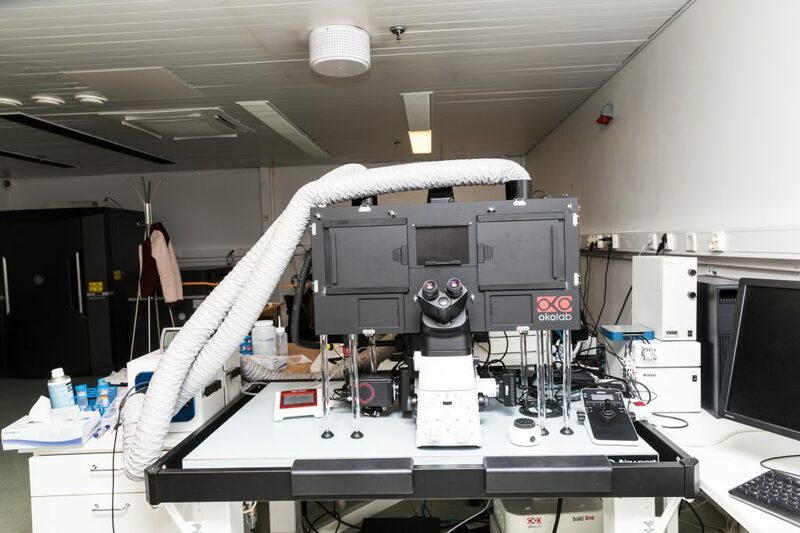 For live cell imaging the system is equipped with a temperature- and atmosphere-controlled hood and pump for long term water-immersion objective use. Laser lines: 4-line Argon (458/476/488/514nm), 543nm and 633nm. The Leica SP5 MP is a multiphoton microscope system with a DM6000 CFS upright microscope. 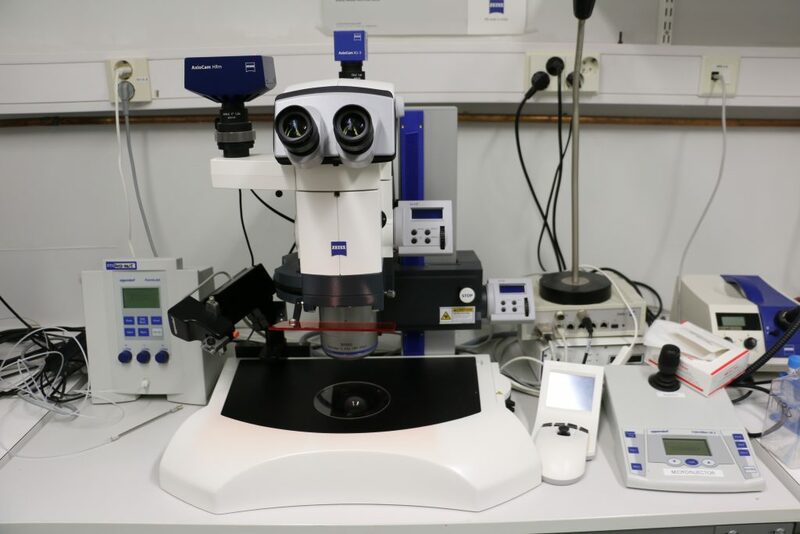 This microscope is specially useful for intravital deep tissue imaging due to the high tissue penetration depth (several hundred microns) and minimal phototoxicity/photobleaching. An integrated resonant scanner enables image acquisition at video rate (25 fps at 512 x 512 pixels). 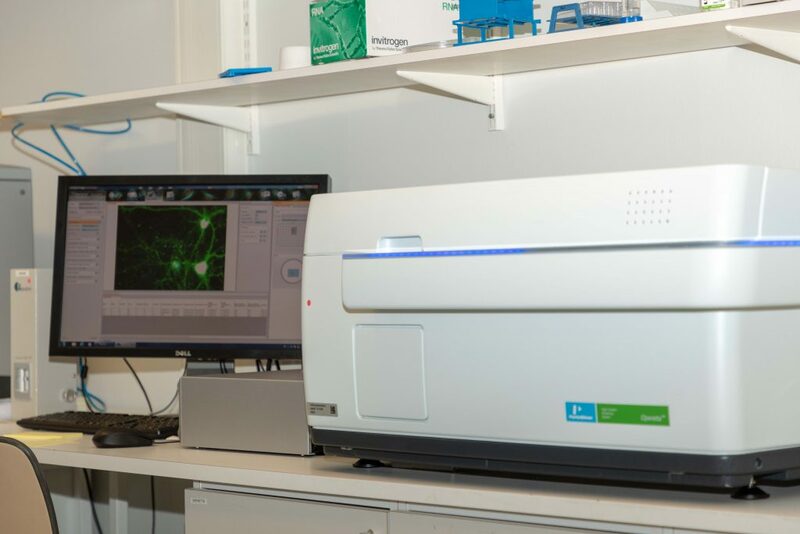 The BD Pathway 855 is a high content imaging system that captures images of live or fixed cells and model organisms in widefield or spinning-disk confocal mode. It provides automated multi-point imaging with CO2/temperature control. Plate replenishment from adjacent storage with capacity for 200 cell/reagent plates and tip racks permits on-stage pipetting of compounds to capture responses of live cells. Quantitative microscopy is ensured by calibrated lamps delivering stability in the millisec to month time range. Multi-terabype storage connects instruments to dedicated Attovision segmentation, analysis and data mining software for batch processing on 3 configured analysis workstations.Available objectives from 1.25x to 40x N.A. 0.95. Wheels contain 16 excitation filters and 8 emission filters. Objectives move under fixed stage allowing imaging also of suspension cells. For 96, 384 or 1536 well SBS plates. An SBS-compatible slide holder is available. Integrated with automated cell incubator, ambient and cooled storage racks (total capacity 200 plates) as well as liquid handling table for reagent dispenser or plate washer. A fully motorized inverted widefield fluorescence microscope ideal for live-cell imaging applications. Equipped with a small stage incubator for temperature control and CO2 supply. Based on its Nipkow disk technology with microlenses, the Yokogawa CSU unit is a particularly useful tool for high speed, live cell imaging. Allows excitation in the range of 488 – 640 nm. Its SlideBook software allows control of the motorized filters, shutters and stages to set up time-lapse imaging experiments in multiple channels, and multiple stage positions. Excitation and detection objectives designed by Special Optics for dipping media where Refractive Indices (RI) range from 1.33 to 1.56 (NA 0.37-0.43), but will also work in air. Magnification range of 15.3x-17.9 across the RI ranges. The lateral resolution >660 µm and field of view <870 µm with a 12mm diameter imaging sphere. Image of one of the objective configurations of Aurora single photon development system to illustrate the working distance and space between the objectives. Our Lambert Instruments LIFA is a fast frequency domain FLIM system, which is attached to an inverted Carl Zeiss AxioImager microscope body. With this system we can image only fixed samples in widefield mode. The light source is multi-LED with excitation lines 406, 469 and 533nm. With the LIFA system we can image lifetimes with a resolution < 100 ps in a range of 0.1 ns – 1 ms. The system is equipped with high-content imaging possibility. 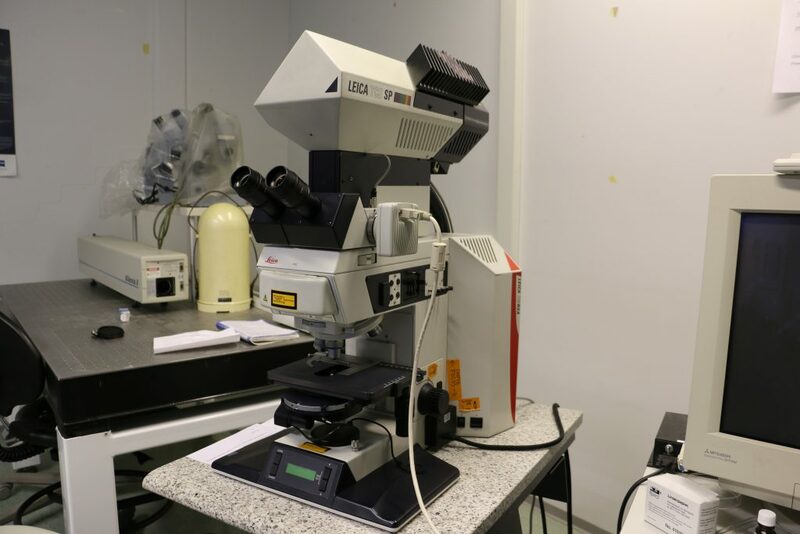 Our TIRF has two different cameras dedicated to different applications: a very sensitive emccd camera with a 512×512 chip, and a sensitive and fast high resolution sCMOS camera. 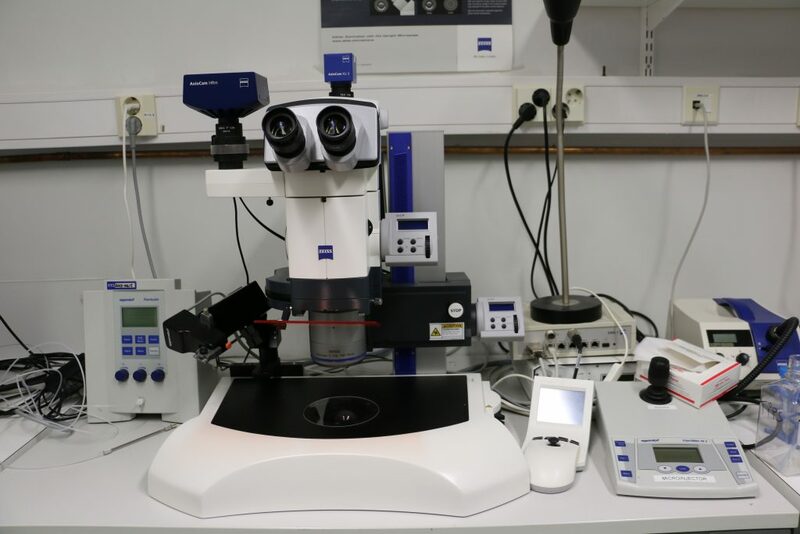 The microscope is equipped with incubation elements, motorized stage and Zeiss Definite Focus drift correction device. 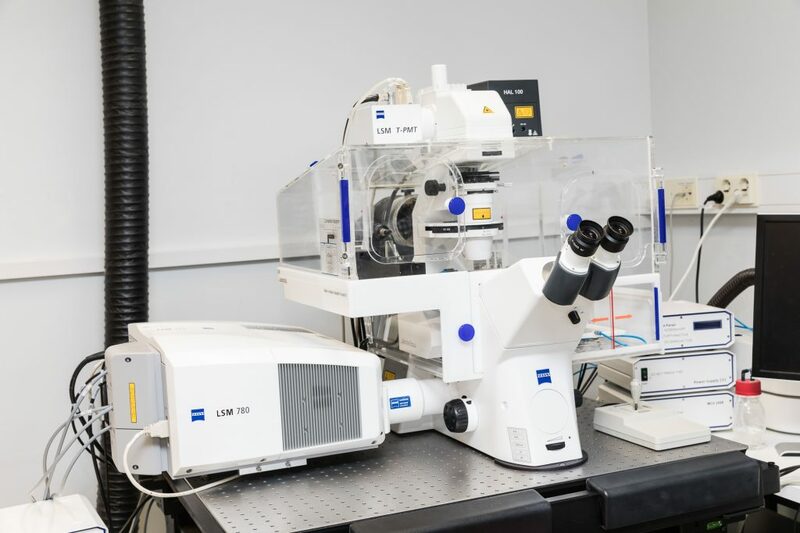 The Zeiss SteREO Lumar.V12 fluorescence stereo microscope is an instrument for low-magnification microscopy. 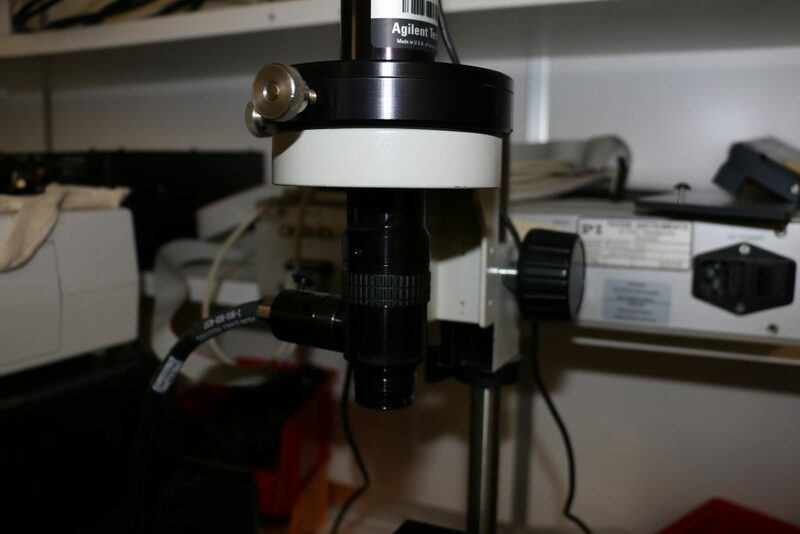 Our 0.8x and 1.2x long working distance objectives allow a researcher to perform (for example) dissection using objective lenses permitting a maximal magnification of 120x. The versatility of the instrument permits imaging of entire mouse brain slices or single fluorescent cells, using the same objective. 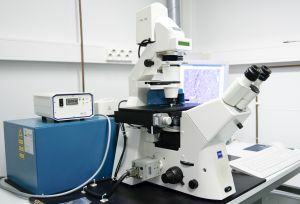 An Eppendorf InjectMan NI2 semi-automatic microinjection device has been installed beside the stereo microscope allowing, for example, injection into zebrafish embryos. Any material of low granularity and size can be microinjected. The most frequently injected materials are DNA, proteins, tracers, and chemicals with or without attached dyes.A manual Eppendorf CellTram Vario microinjector can be used with the motorized InjectMan NI2 holder. Cell Tram Vario is a good tool when cell suspension is injected into tissue. Minimum volume that can be set: <20 nL/<2 nL (coarse/fine). Adhesive caps and Zeiss PALM membrane slides can be purchased from the CIC.